Abstraction Awareness is about deeper understanding of abstraction, a concept so basic to human thinking. Subsequently abstraction is discussed by the means of basic Finite Model Theory. where both sentences can be expressed in FO (see here for formalism). what is also expressible in FO. Between the two axiom systems (I) and (II) there is an essential difference: While (I) lists all existing cases in (2), (II) uses the property of reflexivity (2′) to characterise the structure. The latter has certain advantages: it, can be expanded easily for structures of more than 2 elements, and it states a principle that can be understood by humans. This describes by simple means of basic Finite Model Theory a very important principle in software engineering: modelling properties is more expressive than just collecting cases. This is the reason why test cases can be derived from specifications but not vice versa. Another example is Intentional Programming, addressing that the big picture ‘gets lost’ on the source code level. Like most things in life, expressing properties by models also comes with a downside: While cases as in (I) can always be expressed in FO, properties in general cannot. For example, for expressing that the alphabet of a structure is always of even size, FO is not expressive enough. Thus, altogether cases vs models is always a trade-off. 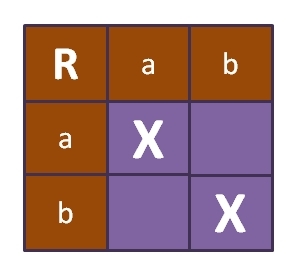 This entry was posted in Mathematics, Reflections on Abstractions and tagged abstraction, abstraction awareness, axiomatizable, Case, Finite Model Theory, finite models, formal methods, intentional programming, model, model theory, modeling, modeling theory, refinement, reflections on abstractions, ROA, specification, Test. Bookmark the permalink.